The questions put to candidates in the election forums I have been moderating for the Edmonton Federation of Community Leagues this fall are about what city hall can do for citizens. 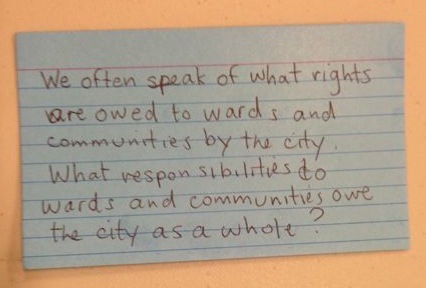 No one is asking what citizens – as communities – contribute to the city as a whole. What do we owe to the city as a whole? A number of trade-offs immediately come to mind with this question: welcome the LRT through my neighbourhood to allow the larger transportation network to work better; allow higher density housing in my neighbourhood to make better use of city infrastructure; welcome a variety of housing in my neighbourhood to accommodate a variety of citizens; encourage expenditures for neighbourhood renewal first in neighbourhoods that really need it. To truly serve the whole in these (and many other) ways, we need to co-create a social habitat that allows for them to happen. We need to co-create the space to see what the city needs, versus what my community needs. Citizens are city makers. We build the physical city in which we live, we build the economic systems in which we work, and we build the social habitat that helps us navigate the world. We choose the city we want by naming it, describing it. When we speak of what’s wrong, we get more of what’s wrong. It’s time to create a social habitat that aims for more of what we want, that delivers on the improvements we seek. This is important work, because at every scale (self, family, neighbourhood/organization, city, nation, planet), what we build lasts: it reverberates for a long time to come. Everything we do shapes our city. Connect to your Highest Self. Trust your antennae of possibility. Are your choices serving You? Stand at the edge. The biggest threshold you have to face is you. Don’t take your thoughts to seriously. Are you holding a story that limits your experience of the city? Choose to show up, consciously. Put your true self out into the world. Choose work that feels good. When you do, you expand the contributions you make to the world. Choose to renew patterns. Let the patterns that refresh you, refresh you. Let new patterns revive you. There’s strength in surrender. Connect your Self to your city. What you bring to the world is valuable. Focus your energy and trust your contributions. Be profound. Be curious and get involved. Notice what surprises you, and you can learn a lot about yourself and your habitat. Intentionally be a vehicle for the evolutionary impulse in the world. Tap into who you really are. Cultivate collective ingenuity at any and every scale. Nurture this emerging form of leadership. In what ways are you an evolutionary agent for your city? Last fall, I co-hosted two workshops with The Natural Step Canada to engage multiple generations in a discussion on what makes a neighbourhood awesome. Here is a link to the summary report, full of Edmonton’s local knowledge. The workshops were experiments. Rather than a conventional format where the experts send information to participants, we designed workshops that allowed the participants to design neighbourhoods and then notice the characteristics of what they built. They found their own sustainability principles and you can find them, along with a description and photos of the process, in the link above. Are cities – more like the Titanic or an iPhone? Last week, as I was playing the role of MC at a gathering of 170 city officials and the development/building community I found myself with a decision: read the poem I just wrote or sit on it. We had just spent the afternoon talking about all the initiatives where people who usually bang each other’s heads have started to work together. It’s certainly a work in progress. Relationships have started where there were none. Understanding of each others’ priorities, and the worlds in which each other works has begun. And a sense of the different roles that city hall and the business community play – and the legitimacy of those roles – is also emerging. As I enjoyed 7 fellow Edmontonians and their Pecha Kucha presentations, some of their words jumped out at me and I found myself organizing them, making meaning of what they were collectively offering us, the audience. As MC, I had one final duty: thank them and pass the microphone over to the last speaker who would thank all participants. I squirmed in anticipation: would I read and share the poem, or leave it in my notebook. A four letter word kept popping up all day: RISK. I chose to risk it. I offered myself and what I see. That’s what we do to make our cities as good as they can be. Where are you stretching beyond your comfort zone to pursue what you love to do? Esther Starkman School is in the news for being overcrowded, leaving Edmonton Public Schools with unpopular tough decisions. After some digging around in planning documents available online here is an overview of the development process, from an open field to school construction. Links are provided for readers that wish to dig around on their own. The ‘plot’ of this post is this: it starts with an open field and a concept, then a plan, followed by implementation – funding and building new schools. In writing this, I see that planning is one thing and implementation is the other. But who is responsible for what? Prior to the formal planning that takes place to build new neighbourhoods, land owners and developers that want to build new neighbourhoods prepare a Servicing Concept Design Brief. It is not a statutory plan with legal ‘teeth’ but it does have a significant purpose to get the lay of the land before the specific planning of several neighbourhoods takes place in Neighbourhood Structure Plans. I can trace the Esther Starkman school site back to the Terwillegar Heights Servicing Concept Design Brief, a “generalized framework for municipal infrastructure, servicing, planning and development guidelines and basic environmental requirements (p. 1)” for the area. The first draft of this document was prepared in 1990 and was adopted by City Council in 1992. It has been amended several times since, most recently in July 2012. The Terwillegar Heights Servicing Concept Design Brief covers the following neighbourhoods: Haddow, Leger, Hodgson, McGrath, Mactaggart, South Terwillegar and Terwillegar Towne. The City of Edmonton and developers are expected to work in cooperation with and the school boards to determine physical site requirements and future student attendance areas (p. 40). Neighbourhood size and configuration. 6000 people will generate adequate number of students for a Public k-8 school. Larger population is needed for Catholic school. Elementary age children should not walk more that 1.2 km to a school site. Access and circulation. The planning of schools sites and vehicular and pedestrian transportation systems needs to be coordinated. Parcel configuration and frontage. Where possible, put Public and Catholic school sites, and park sites, together to make more efficient use of land and facilities. Dimensions of school sites are also articulated. Soil conditions. When preparing the NSP, soil tests geotechnical information are required to avoid potential hazards. Servicing. The developer is expected to plan how to provide services to the school sites (water, wastewater, gas, electricity). Pipeline corridors / utility rights-of-way. Educational and recreational facilities need to be separated from these utilities. In some instances, they can be adjacent to take advantage of pedestrian corridors, but there must be adequate separation distance. Site drainage. The developer is required to ensure water drains off the future school site. Storm water management. Wet storm water management facilities (ie ponds) should not be located on or adjacent school sites. Assembly of land and staging of site development. The land for school sites is assembled through the subdivision process – which does not happen until all the planning work is complete. The staging of development “will give high priority to the assembly and servicing of school/park sites.” The Esther Starkman school site is named here as essential for early stages of development. A Catholic K-8 is named. Commercial development. The school boards perceive that commercial and K-8 schools will create pedestrian/vehicular conflicts. Commercial development should be separated from school sites. Esther Starkman is one of the two K-8 schools. Two schools are not yet built – a K-8 within Tomlinson Common to the west, and Edmonton Catholic’s elementary / junior high school adjacent to Ester Starkman. To implement a Servicing Concept Design Brief, smaller and more specific plans are prepared for Council’s approval. These are called Neighbourhood Area Structure Plans. In the map above, these NASPs are noted in blue writing. Esther Starkman school is found in the Terwillegar Towne Neighbourhood Area Structure Plan, a document adopted by City Council as a bylaw first in 1995, and amended by Council most recently in 2003. The land use concept (figure 7 on p. 51), in 2003, shows two K-8 school sites for Edmonton Public Schools – Esther Starkman school and a second site within Tomlinson Common. Adjacent to Esther Starkman is a site for Edmonton Catholic Schools’ elementary / junior high school. The land allocation for three schools in the Neighbourhood Area Structure Plan is consistent with the Servicing Concept Design Brief. Implementation of the Terwillegar Towne Neighbourhood Structure Plan took place in many ways. The land was subdivided to reflect the plan. For schools, this process allows a legal description and title to school land, just as it does for developers and builders to build the homes we eventually buy. This process makes it clear who owns what land. Zoning further dictates what can happen on the land. When development begins, land is graded, pipes are placed in the ground, roads and sidewalks are installed, parks are developed and buildings are built – homes, business and schools alike. For schools, the site is prepared for a building, which only happens when the funds are secured for construction. Capital funding for schools in Alberta is administered by the provincial government. Recall the Servicing Concept Design Brief. It expected in Terwillegar town, three schools: two K-8 for Edmonton Public Schools and one elementary / junior high school for Edmonton Catholic Schools. In April of each year, school boards must submit a three-year capital plan for the following three years to the Government of Alberta, who funds the construction of schools. Esther Starkman officially opened on September 6, 2010. Edmonton Public Schools’ proposed Three-Year Capital Plan (2013-16), dated March 2012, still shows the need for a second K-9 school in Terwillegar Heights (presumably at Tomlinson Common). The Three-Year Capital Plan (2011-2014), prepared in 2010 also shows a K-6 school in Terwillegar Heights. In at least 2010, Edmonton Public Schools asked the Government of Alberta for an additional K-6/8 school in Terwilligar Towne. The question is not whether Edmonton Public Schools adequately planned for the schools. It appears that they did. What is lacking is implementation – the actual construction of the needed schools. For further investigation – did Edmonton Public Schools make the necessary funding requests of the Government of Alberta – and what was the Government’s response? In a subsequent post I will examine the remaining NASPs in Terwillegar to Heights to confirm whether the number of schools planned for at a larger scale were provided. Please chime in – let’s see what we can figure out. We only know how well our city is doing when we have feedback loops, giving us data on our city’s performance. I have been exploring to date the relationship between our economic life – and our ability to create diverse, new work – and our city habitat. The only way to fully comprehend the relationship between our work and the cities we build (our habitat) is through feedback systems. A couple of simple feedback loops have popped up in my city of Edmonton, Alberta, Canada this week about the city we are building. The topics: a growth coordination strategy and design guidelines for our new neighbourhoods. The City of Edmonton released this week a draft Growth Coordination Strategy, highlighting the necessary steps to coordinate the city’s population growth to ensure environmental, social and fiscal sustainability. This is an effort to consider more information as we make decisions about how to build our city. The local news media have covered this story, providing feedback to the wider population: Edmonton Journal, Metro News, Even City Councilor Don Iveson has information for constituents on his web site. Little bits and pieces were on the radio this morning, and a bit on twitter under the #yeg hashtag. It’s emerging as a public conversation about what we are building, who pays for it and what it costs. The work of creating Edmonton to day did not rely only on planners and engineers. Politicians make critical decisions about infrastructure. Business owners and leaders make decisions about where to locate their business. Builders and land developers choose what to build. Citizens make decisions every day that impact the physical shape a city takes, and certainly the spirit of a city. NGOs also make key decisions that affect how a city takes its shape. So how do a couple of reports in City Hall serve the role of feedback loops? City Hall prepares reports, which is one form of feedback. It also creates opportunities for citizens to discuss and reflect on our city. Even if you don’t read the document, the media coverage is helping us collectively reflect on what we build, where we build it, why we build it and what it costs. If you are a citizen of Edmonton, I invite you to take a look at the Growth Coordination Strategy. More importantly, they will be asking for citizen feedback. In the case of the design guidelines for new neighbourhoods, the IdeaShare is a fantastic way for citizens to see what we collectively think about the city we are building for ourselves. If you are looking for ideas, you might want to check out Edmonton’s promising practices that have been documented. There is no report yet for this project, but you have an opportunity to help it take its shape. More importantly, you can reflect and be part of shaping our city habitat here in Edmonton. In future posts, I will be articulating more intense feedback loops. In the meantime, look for ways to provide and be a feedback loop. Be a part of the city’s feedback system. That work will certainly create city habitats that serve us well. I can’t wait to see the GO Centre this Saturday, Edmonton’s latest recreation facility. It sounds remarkable – three huge gymnasiums that can be 12 full size basketball courts or 25 volleyball courts. And a gym for the gymnasts. It is both a facility for the U of A teams and a community centre. And unlike most recreational capital projects in cities, it came in on budget. And the price tag was only $38 million. The funds for the GO Centre are from federal, provincial and city governments. $4 million in private donations were also made by individuals, businesses and community partners. The donations are not what are unique about this project – it is the entrepreneurial spirit within Edmonton that is worth noticing. One of the two usual suspects – the City of Edmonton or the University of Alberta – could have built the facility with $4 million dollars in sponsorship. But what happened here reveals so much more of Edmonton’s creative entrepreneurial spirit. d themselves to meet the needs of their organizations, their sport communities, the University community and the wider community. What I appreciate about this project is that the handful of Edmontonians needed to get the project underway stepped up to do it, and chose to look after their own organizations needs, but also that of the larger community. Federal, provincial and city government supported their work. The GO Centre builds on the City’s Recreation Master Plan and delivers on a trend toward multi-purpose facilities with versatile and flexible spaces. They take it a step forward and build a facility for sports that are underrepresented. They are thinking beyond traditional boundaries of partnership: the U of A is served, the community is served, the Edmonton Capital Region is served. In all of this, I find myself curious about the role of City Hall in this entrepreneurial spirit. At a minimum , the City is responsible for the basic infrastructure on which we build our city. The roads to get places, the pipes to move water and wastewater, the waste we generate. On this we build our city – and our recreation facilities. In addition, the City brings rules and regulations for what we build and where, and ensure that the minimum standards for construction meet safety and construction standards through the permitting and building inspection processes. The City provides emergency support in policing and fire protection. All of this, in the strictest sense, is a service not performed by others in community. For the provision of these services, the word ‘entrepreneurship’ in City Hall is not about competition, but finding the balance between creativity and efficiency in the delivery of these services. Outside these service areas, however, entrepreneurship takes on a different meaning. Case in point – recreation facilities. The City builds and operates recreational facilities, but unlike the service areas noted above, other players also provide facilities and programs. The city is a player among many. That immediately conjures a picture of these players in competition with each other. But the GO Centre illustrates that that is not what is happening. Entrepreneurship in this case is big scale collaboration to work in new ways to build what really needs to be built. Multi-sport facilities already exist for hockey, swimming, indoor soccer (Tri-Leisure Centre, Millenium Place, Terwilligar). The GO Centre meets a whole new need and compliments the facilities that are already in place. City Hall could have fought this, with hurt feelings that others are stepping on its feet as a recreation service provider. The City could have insisted that its role is to build such facilities and missed the opportunity for the community to meet its own needs. Establish (and enforcing) the rules that ensure what we build meets our collective standards. An entrepreneurial city hall is one that makes room for the city’s creativity – the ultimate entrepreneurship. For readers interested in Spiral Dynamics integral: The GO Centre partnership is an ORANGE initiative. To do more of this kind of work, City Hall will have to recalibrate its BLUEness. It doesn’t lose its BLUEness, but adjusts its focus to provide the structure needed for the city’s entrepreneurial ORANGE spirit to emerge more fully. What would BLUE in service to ORANGE really look like? The GO Centre’s ORANGE flavor is also interesting because it fully intends to deliver on PURPLE and RED threads by building community and providing a healthy place for competition and sport. Scott Hennig, “Partnership, not taxes, the way to GO,” Edmonton Journal, p, A21, September 29, 2011. How we create our cities and towns has an impact on the quality – and longevity – of our existence. While this may feel far off, irrelevant and easy to dismiss, there is a simple and familiar metaphor that highlights our individual and collective situation: it’s our bed, we have to lay in it. Proximity to quality transit, parks may cut diabetes risk: healthy neighbourhoods are 38% less likely to develop disease. People need to water to survive, let alone be healthy and thrive. Further, “people who live in neighbourhoods with safe sidewalks, ample parks, good public transportation and ready access to fresh fruits and vegetables are 38 per cent less likely to develop diabetes.” The point: as we create our cities and towns, we make decisions everywhere, big and small, that have an impact on our well-being. We decide whether we wish to have a habitat that supports our well-being. We decide whether or not we wish to make it easy or hard for people to exercise and eat right. We decide whether we care or not if collectively we look after the places and people we live in and with, and rely upon. I am not in support of or in opposition to the arguments in these pieces of journalism. Rather, my intention is to highlight the often unconsidered consequences of our choices as we create and recreate our cities, towns and communities. In choosing to leave with each other we have made implicit commitments to each other. In choosing to create and live in larger and larger settlements (and even the small ones), we specialize what we do for each other and we advance what we are capable of. We are growing and evolving as a species. Because of this specialization, we have made great advancements in health care, in communication technologies. None of this would have happened without the creation of cities. We live together so we can grow and evolve as individuals and together. Yet these articles point to a bit of a conundrum: what if the choices we are making in how we create our cities is undermining our very evolution? What if we harm our ecosystem to a degree where our existence is threatened? What if we design our cities to ensure people are nowhere near as healthy as they could be? Is the purpose of a city to harm humans or to support humans’ growth and evolution? Which purpose do the choices we make as citizens, community organizations, NGOs, businesses, developers and builders, and public institutions serve? As we have just wrapped up an Art of Hosting and Harvesting gathering in Edmonton, Alberta, Canada yesterday, I sense a distinct gift received by the participants. Not unlike the first bicycle we long for – a whole new way to move through the world. This is a wondrous gift to receive, but that first bicycle does not come ready to use. In fact, great support is needed to figure out how to ride a bike: love and encouragement from my teachers, a hand on the seat for balance as I figure out this new movement, a hand near the seat when I don’t believe I can do it on my own, and a teacher who know just when to let go to let me try it on my own. And of course, scraped knees and hands as we fall and start all over again. Until we are ready to roll, practice for many years, then teach what we know to another. Host your self, and others, well. The Edmonton Journal’s Sarah O’Donnell and Edmonton programmer Mack Male, have painted a picture for Edmonton residents and decision makers about how our city is growing, especially in light of recent Edmonton Public Schools decisions to close inner city schools. The article and mapping show us where young families are living, and by implication where schools are needed based on the numbers of children nearby. Using this logic, it makes perfect sense to close schools where there are fewer children. Need is based on numbers of children, no more no less. Families move to the suburbs and school trustees follow the families. It’s that simple. Or is it? This conversation seems to make several assumptions. I offer several below to test if they are the assumptions we are using, and /or if we wish to consciously create a new set of assumptions. They drive how we build and adjust the city we live in, the city we are designing while living in it. Assumption 2: We have unlimited funds for infrastructure now and in the future. We expand our city without contemplating the full costs of doing so. We let school buildings close. We let vacant land remain vacant when servicing infrastructure is near by. We let land, and all the utilities serving that land, remain underutilized. If we are not able to maintain our current infrastructure well now, how do we expect to do so in the future? City Hall, for example, faces huge capital and operating budget challenges, yet we continue to spread ourselves thin. We behave as if we have unlimited revenue now and in the future. Are our pockets (as taxpayers) that full? Assumption 3: We need a lot of space from our neighbours. It seems that having oodles of space – in our yards and homes – drives Edmonton’s design. Why are we afraid of being close to other people? Or sharing park space instead of large private yards? What is behind this? What makes neighbours bad, especially if there are a lot of them? Perhaps the devil is not in the density, but in the design of how we build the buildings and the space around them. What if we built exciting spaces and ensured the services were on hand – like schools, LRT – to create viable neighbourhoods. Viable from a social, environmental and fiscal perspective. We have yet to really pay for all this space we are enjoying. Assumption 4: School boards don’t build cities – City Hall does. Schools have an absolutely critical role to play in physically building cities – look at the schools and green spaces everywhere. They also play a key role in supporting the well-being of neighbourhoods. Schools are critical formal and informal gathering places that help make a neighbourhood healthy. A school board’s decisions are critical. They are not isolated from everyone else’s actions. Our city builders include school systems (secondary and postsecondary), health systems, energy and water systems, city hall, and our builders and developers. No one entity or initiative works completely in isolation – they all have a piece of the neighbourhood puzzle. I suspect that these principles seem innocuous, but they are not when we have the feedback systems in place to truly understand if our actions are in line with our goals. The City of Edmonton, in creating and providing open source data, is providing a critical feedback loop for Edmontonians to understand how the city we are creating works. There are exciting conversations ahead in Edmonton’s future. Our collective actions -as citizens, community organizations, school systems, business owners, city government, health providers, developers, builders, realtors, home buyers, etc. – create our city. Is it the one we want?